Another part of my workshop “once and for all” cleanup and organization effort was installing a pegboard organization wall for tool storage. 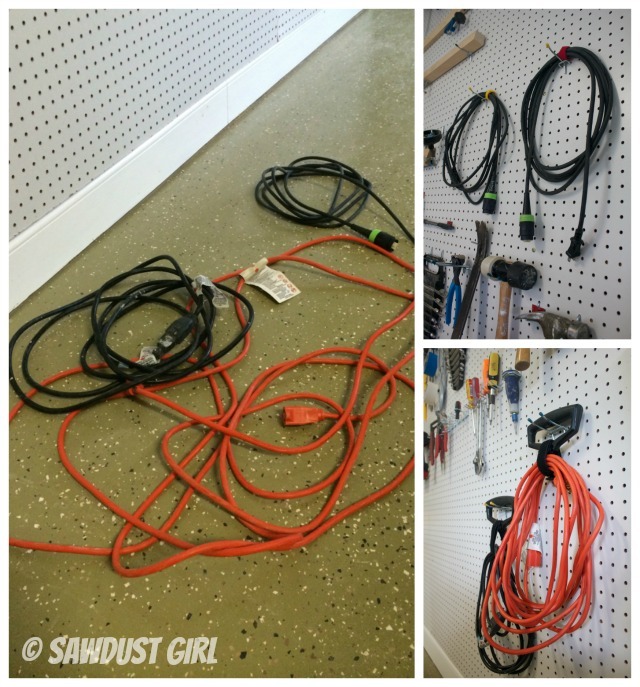 A pegboard organization wall is an easy and inexpensive way to organize and store your workshop tools. There’s a lot of wall in the workshop and you know don’t like to waste space. This post is sponsored by Scotch ® Brand. 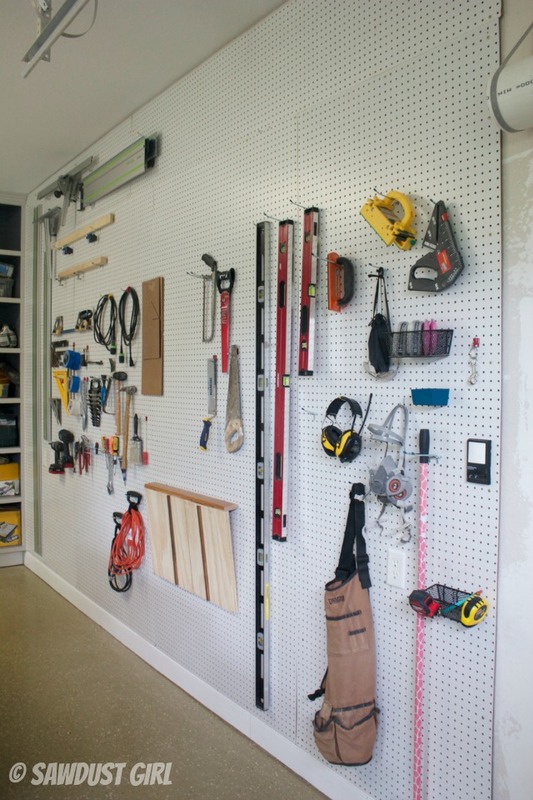 To install pegboard, you have to create space between the pegboard and the wall for the hooks and accessories. I cut 3/8″ thick strips of wood off a 2×4. If you don’t have a table saw and thin strip cutting guide, you can purchase 1×2’s. They’re like $1 for an 8′ length. -Start by removing receptacle covers and marking studs on the wall. Mark stud location on baseboard with painters tape so you know where to put your screws once the pegboard is on the wall, covering your pencil marks. -Nail wood strips to wall making sure to hit studs. I spaced my wood strips about 18″ apart. -Secure strip of wood directly above and below outlets. -Secure the pegboard to the wall with screws — make sure you hit the studs. Choose the length of screw depending on the thickness of your wood strips. I used 2″ screws with a large washer head so they wouldn’t pull through the pegboard. -You might need help holding the pegboard in place while you secure it. It’s difficult to lift and hold a full sheet of pegboard in place while driving in screws to secure to the wall. -I have 10′ ceilings so I secured a full pegboard and then added more wood strips and pegboard to fill in the bare space. Even though I have to use a ladder to get to top of the wall I wanted to take advantage of every bit of storage as possible. I have things to store that I don’t use very often so I’ll put those items at the top. -Transfer outlet location onto pegboard and cut out the hole using a trim saw or jigsaw. The rest is FUN organizational bliss! 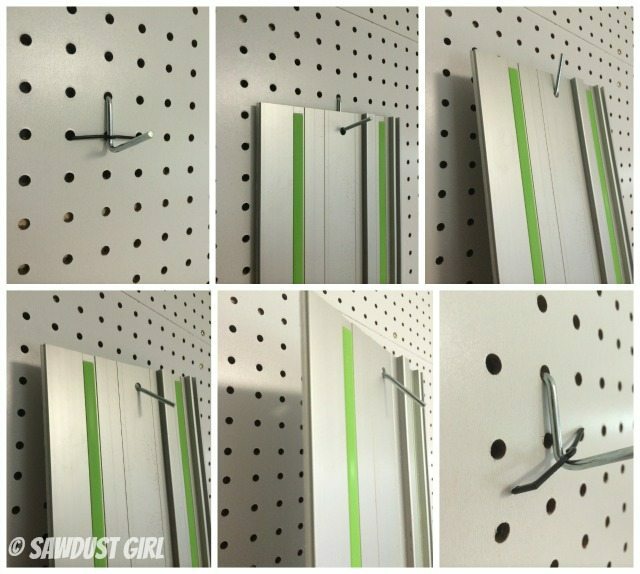 Use your pegboard hooks and accessories to hang your tools where you want them. My Scotch Handle Straps and Bundling Straps keep my extension cords bundled and ready to grab and use. My Festool tools each have a removable cord and there are two different ends. Certain tools require certain cords and then ends won’t attach if it’s the wrong cord (I’m sure it has something to do with the electrical current each tool needs to draw). I use color coded Scotch Bundling Straps to designate the type of cord so I can grab it and go without examining the end of the tool and then the end of the cord. I just put a little matching colored dot on the tool and grab the right cord. One perpetual problem with regular pegboard hooks is that they tend to fall out when you remove a tool. Even the plastic arm thingy’s that are meant to hold the hook in place while you pull the tool from it don’t work very well. It drives me CRAZY! There are hooks that have brackets and screws that KEEP them in place. The problem with those are the screws make a big mess of a hole and if you ever want to move said hook you leave behind said mess. Eventually you have a hot mess of a pegboard wall. I like my hooks to stay put when I want them to stay put but let me move them without major damage when I want to move them. So I used the Scotch Extreme Mounting Tape to hold my hooks in place. The tape is double sided but I simply did not remove the backing after I stuck in in place. It HOLDS but I can pull up if I want to. It did pull up a bit of paint with it but didn’t damage the board. I LOVE my new pegboard walls (I’ve done this on both walls in my shop. I’m a working machine when I don’t have to waste time searching for tools, safety gear, push sticks, adjustment wrenches etc. I keep everything handy near the space where I need it and it takes seconds to grab nearly anything I need while working – or cleaning up. rolling workshop tool cart with pegboard storage. I’ve had a sheet of pegboard in my garage for months (it was in the scrap pile at Home Depot for half price and I couldn’t pass it up). I just need a tiny piece to build a little jewelry holder for saylor, and will have plenty left to put up somewhere in the garage. This might get me motivated to finally install it and get organized! Those pictures make my heart race! I am in love! Now to clean out basement to create my workshop! I’m jealous of all your tools! We need to do this in our garage. I may be the only one who doesn’t like pegboard… I would probably like it more if it wasn’t white. Maybe have a design painted on it? But oh, well, I guess I am allowed “not” to like something, right? But it does the job in keeping all the tools organized. I enjoyed your article, but I am a neat freak and don’t like the looks of the tape on each hook. However, like you, it drives me nuts when pegs fall out. What are other ways to secure the pegs? Hot Melt glue from a glue gun. the glue & the gun are very inexpensive at the big box stores. Where did you get the peg board, at what cost? ?